Get 24/7 support and peace of mind; Virtucom works directly with your IT staff or becomes it. Achieve smoother functionality and more efficient IT solutions with Virtucom’s infrastructure management services. 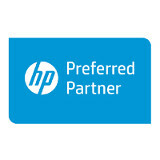 IT selection and management doesn’t have to be overwhelming. In fact, it can be as hands-off as you want it to be. 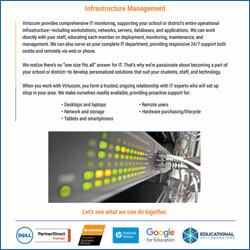 Virtucom provides comprehensive IT monitoring, supporting your school or district’s entire operational infrastructure—including workstations, networks, servers, databases, and applications. Using our knowledge and experience, we work directly with your staff, educating each member on deployment, monitoring, maintenance, and management. We can also serve as your complete IT department, providing responsive 24/7 support both onsite and remotely via web or phone. We realize there’s no “one size fits all” answer for IT. That’s why we’re passionate about becoming a part of your school or district—to develop personalized solutions that suit your students, staff, and technology. Take the guesswork out of infrastructure management. Contact us today to see how we can help your school or district.